Back in 2015 and ’16, Peter Tuddenham sparked a variety of conversations about systems literacy. The good news, based on over 40 years of experience in offering systems education at The Open University (UK), is that despite our culture and institutions (norms, or rules of the ‘human game’) a certain percentage of us retain a systemic sensibility—something which we may have been born with, or which developed in childhood. What is missing, however, are the contexts for a systemic sensibility to flourish, to be recovered and/or fostered. 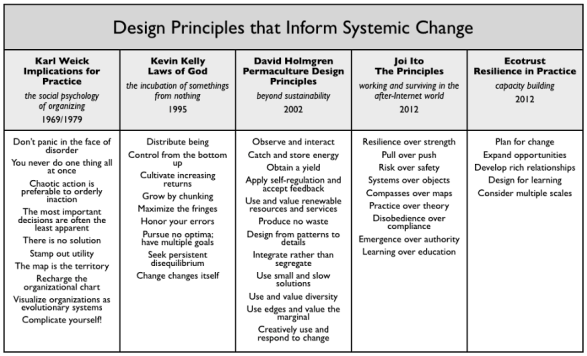 Investment in building systems literacy and then system thinking in practice capability … is missing in education as well as organizational life. 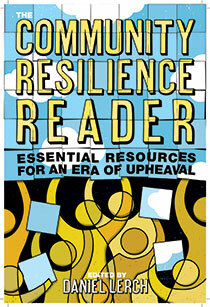 When Daniel Lerch of the Post Carbon Institute invited me to write a chapter on systems for The Community Resilience Reader, I adopted the literacy framing as well. Life is full of unknowns, rich with complexities. Two people experiencing a situation might interpret it differently. Even familiar situations might take unpredictable turns. Systems thinking is a way of seeing patterns amidst the messiness of life. Patterns give coherence to one’s experience. 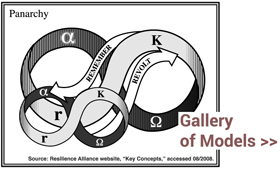 A systems toolkit of methods, models, concepts, and metaphors can be used to both interpret such patterns and inform one’s actions. For today’s challenges – for creating a post-carbon world – familiarity with this toolkit represents a basic and essential literacy. You go out to your favorite noodle shop. They’ve got four types of ramen, but you always order the shio. Should you stick with it or try a different one? The ramen-lover’s quandary illustrates, on a personal (and whimsical) level, a trade-off that occurs across systems from biological to organizational and social: exploiting current tendencies, understandings, or viabilities comes at the expense of exploring novel variations, approaches, or possibilities. In “Dual thinking for scientists,” a paper in the Ecology and Society special-feature-in-progress on “Reconciling Art and Science for Sustainability,” Marten Scheffer and ten coauthors discuss the exploration/exploitation-like duality in human cognition and consider its implications for scientific progress. To readers of Daniel Kahneman, these two cognitive modes are familiar as system-I and system-II. The former diverges, associates, and intuits; the latter reasons and rationalizes. Provocative indeed. How then to engage this science-as-usual regime? — so as to engender a shift toward a science that more effectively stimulates and incorporates system-I thinking? “Perhaps we should use some of the education techniques from arts to boost adventurous exploration and ‘learning at the edge of chaos,’” they conclude. Root-Bernstein, R. and M. Root-Bernstein. 1999. Sparks of genius: the thirteen thinking tools of the world’s most creative people. Mariner Books, New York, NY, USA. Holland, J. H. 1975. Adaptation in natural and artificial systems: an introduction with application to biology, control and artificial intelligence. University of Michigan Press, Ann Arbor, MI, USA. Kahneman, D. 2011. Thinking, fast and slow. Farrar, Straus and Giroux, New York, NY, USA. March, J. G. 1991. Exploration and exploitation in organizational learning. Organization Science 2(1):71-87. Page, S. E. 2015 (accessed). Understanding complexity. The Teaching Company, Chantilly, VA, USA. Scheffer, M., J. Bascompte, T. K. Bjordam, S. R. Carpenter, L. B. Clarke, C. Folke, P. Marquet, N. Mazzeo, M. Meerhoff, O. Sala, and F. R. Westley. 2015. Dual thinking for scientists. Ecology and Society 20(2):3. ‘Action research,’ described by Reason and Bradbury (2008: 11), ‘nearly always starts with a question of the kind, “how can we improve this situation?”’ In essence, then, the question that action research starts with is a question of design: the design of an inquiry or engagement, the design of an ‘intervention.’ Action research designs are characterized by cycles of ‘action and reflection, theory and practice, in participation with others’ (Reason and Bradbury, 2008: 4). Advocates for design have also made a narrower claim for design, which is central to the concept of ‘design thinking’ (Buchanan, 1992; Brown, 2009). This claim is that specific understandings and repertoires cultivated through the study and performance of the design arts – the applied arts of graphic design, industrial design, textile and fashion design, digital design, architecture, engineering, and so on – are applicable to nontraditional contexts and situations, or applicable beyond the design of material and informational artifacts. This claim has garnered much attention and ignited much debate (NextD Journal, 2007). My own sense and annotation of this design debate is as follows: (1) the understandings and repertoires cultivated through the study and performance of the design arts can inform how one designs in nontraditional contexts and situations; (2) at the same time, designerly ways, broadly construed, need not arise from the experiences of the design arts; and (3) it is important to note ways in which the design arts’ traditional focus on material and informational artifacts may skew the development of designerly understandings and repertoires. In this chapter, I describe designerly ways as practical skills for action research. My own standpoint is not that of someone trained in the design arts. Rather, I come to design as someone who has sought to create new possibilities and to change existing situations into preferred ones. More recently, as an instructor in applied systems thinking in a Master of Fine Arts program in Collaborative Design at Pacific Northwest College of Art, I have also come into closer dialogue with people in traditional arts and design fields. My perspective on design is therefore a broad one, as defined above, and a broadly systems-oriented one. Silverman, H. 2015. Designerly Ways for Action Research. Pages 716-723 in H. Bradbury (Ed.) 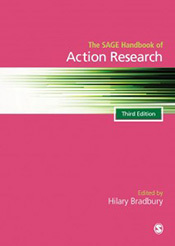 The Sage Handbook of Action Research, Third Edition. Sage Publications: Thousand Oaks, CA, USA. The shortcomings of education-as-usual prompt the question: What is education for? When this topic comes up, listen for mental models. Sometimes, explicitly or not, commentators and critics will describe a version of Bloom’s taxonomy: learning as cognitive, affective, and psychomotor — learning, that is, for the head, heart, and hands. Last year, David Brooks reached for Bloom’s model, or a version of it, in commenting on the popular “excellent sheep” essay, now book, by William Deresiewicz. This past Sunday, Deresiewicz invoked the model in a scathing assessment of higher education, delivered at the PNCA Critical Theory and Creative Research commencement. My interest here is not in Deresiewicz’s critique, courageous and welcome though it certainly is, but rather in the model itself. Higher education, Deresiewicz laments, has become centered around a commercial focus (i.e., hands, in this version), to the diminishment of critical thinking (i.e., head) and abdication of responsibility for self, soul, meaning, and purpose (i.e., heart). Bloom’s model is a touchstone of mine as well. That said, any model affords only a partial view of a complex situation. So as intuitive, informative, and salient as a Bloom-based approach may be, it’s worth looking around for complementary ones. In other words: What models might inform how one understands the successes and failures, challenges and opportunities of contemporary higher education? One that comes to mind is John Warfield’s, which he called The Wandwaver Solution, and which I’ve reproduced at top, alongside a simplified version of Bloom’s. 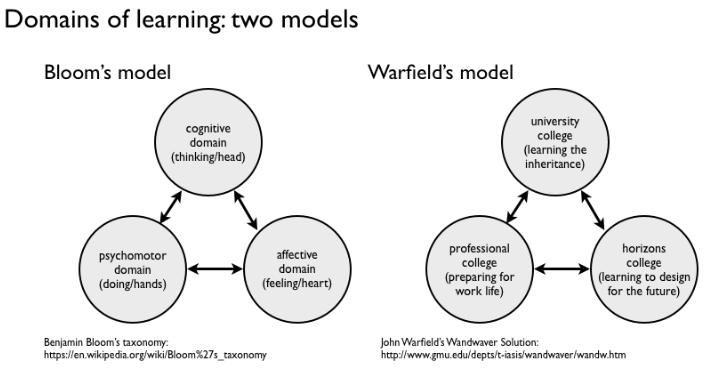 While I labeled this figure “domains of learning,” the word “domain” is used differently in each of these two models. Bloom’s distinctions are drawn around three bodily ways of learning in the human organism, Warfield’s around areas and approaches about and through which we might learn. 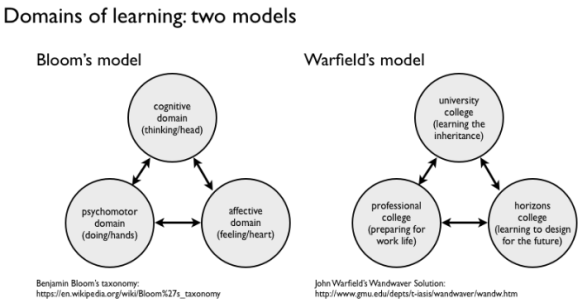 Warfield described his 1996 Wandwaver proposal as “an unbudgeted plan for revolutionary change in the university.” He envisioned university structures and curricula redesigned around colleges of past, present, and future: a University College (learning about the inheritance), a Professional College (preparing for work life), and a Horizons College (learning to design for the future). This latter, the Horizons College, is of course the most novel aspect of Warfield’s sketch proposal, much of which remains unspecified and open to interpretation. Enacting the human project: The structure of the university is designed to mimic and facilitate the temporal accretion of human knowledge — the processes whereby the “inheritance” is sustained and re-examined. Fiercely relevant: Concurrently, the design is future oriented, contextual, focused on horizons of concern or opportunity. Purposeful: A reflecting-on-the-past-while-designing-for-the-future curricula might well afford the types of “mind-expanding, soul-enriching” experiences that William Deresiewicz champions. H/t to Stuart Umpleby, from whose 2014 International Society for the Systems Sciences talk I first learned of the Wandwaver proposal. John Warfield, who passed in 2009, synthesized his thinking in 2006’s An Introduction to Systems Science. Update: Bill Deresiewicz has a new essay, “The Neoliberal Arts,” published in Harper’s today. “Learning to learn” — what practice could be more useful than that? Such learning practices are variously called double-loop or second-order or metacognitive. In research with experts who were asked to verbalize their thinking as they worked, it was revealed that they monitored their own understanding carefully, making note of when additional information was required for understanding, whether new information was consistent with what they already knew, and what analogies could be drawn that would advance their understanding. These metacognitive monitoring activities are an important component of what is called adaptive expertise (Hatano and Inagaki, 1986). Because metacognition often takes the form of an internal conversation, it can easily be assumed that individuals will develop the internal dialogue on their own. Yet many of the strategies we use for thinking reflect cultural norms and methods of inquiry (Hutchins, 1995; Brice-Heath, 1981, 1983; Suina and Smolkin, 1994). Research has demonstrated that children can be taught these strategies, including the ability to predict outcomes, explain to oneself in order to improve understanding, note failures to comprehend, activate background knowledge, plan ahead, and apportion time and memory. Reciprocal teaching, for example, is a technique designed to improve students’ reading comprehension by helping them explicate, elaborate, and monitor their understanding as they read (Palincsar and Brown, 1984). The model for using the meta-cognitive strategies is provided initially by the teacher, and students practice and discuss the strategies as they learn to use them. Ultimately, students are able to prompt themselves and monitor their own comprehension without teacher support. The teaching of metacognitive activities must be incorporated into the subject matter that students are learning (White and Frederickson, 1998). These strategies are not generic across subjects, and attempts to teach them as generic can lead to failure to transfer. Teaching metacognitive strategies in context has been shown to improve understanding in physics (White and Frederickson, 1998), written composition (Scardamalia et al., 1984), and heuristic methods for mathematical problem solving (Schoenfeld, 1983, 1984, 1991). And metacognitive practices have been shown to increase the degree to which students transfer to new settings and events (Lin and Lehman, in press; Palincsar and Brown, 1984; Scardamalia et al., 1984; Schoenfeld, 1983, 1984, 1991). Each of these techniques shares a strategy of teaching and modeling the process of generating alternative approaches (to developing an idea in writing or a strategy for problem solving in mathematics), evaluating their merits in helping to attain a goal, and monitoring progress toward that goal. Class discussions are used to support skill development, with a goal of independence and self-regulation. “I realize that you probably think I’m nuts,” says architect Christopher Alexander near the end of his famous 1996 OOPSLA talk. A standing ovation and an audible “wow” indicate that, nuts or not, the audience of was with him. “What is the connection between: what I am doing in the field of architecture and what you are doing in the field of computing?” Both talk and subsequent paper are organized around this question, regardless of notable differences between the two. The conference was on Object-Oriented Programs, Systems, Languages and Applications; and the 1999 paper was published as “The origins of pattern theory: the future of the theory, and the generation of a living world.” The video was posted in 2013 and only caught my attention recently. Alexander’s story, essentially: There is something we can objectively call “living structure.” We know it when we are in its presence. “The objects that are the most profound, functionally, are the ones that also promote the greatest feeling in us.” I’ve dedicated myself to the creation of living structure. This creation is intentional, and its creation cannot happen without intention. I’m here to ask for your help. One of the efforts of the pattern language was not merely to try to identify structural features which would make the environment positive or nurturing — but also to do it in fashion which could be in everybody’s hands, so that the whole thing would effectively then generate itself, going forward. If, like Bruce S. (and me), you love design principles, you’re in luck. They seem to be everywhere. One reason, I think: When dominant institutions are inadequate to contemporary challenges — when things are stuck — design principles can inform practice, focusing attention on how to move forward, albeit without assurances that such incremental movements will add up to desired outcomes. Some well-known principles are specified by context, like agile software development or adaptive ecosystem management. I’m thinking here, though, about ones that are framed more broadly — ones that can be read as informing understandings and practices of systemic change. At top are four sets I’ve found intriguing and insightful, along with one from a project I led at Ecotrust. Here is a larger version of the image. Seeking to better understand and describe resilience in practice, Ecotrust colleagues and I specified five areas for capacity building. See Resilience & Transformation: A Regional Approach and this post. Clearly, these principles reflect differing vantage points: Weick is an organizational and management theorist, Kelly and Ito bring tech perspectives, Holmgren and Ecotrust environmental backgrounds. Nonetheless, I find there’s a certain complementarity among them — differing emphases, yet each informing the others. To be sure, individual principles can be fairly cryptic, so getting a better grasp of them may require following the links, along with further reading. I’m going to wrap here by re-linking to the worth-re-visiting 2013 talk by Bruce Sterling at SXSW, where Joi Ito’s principles were apparently on display in the Maker Tent. Let me point out the difficulty with this approach — although I respect it very much, and I even understand it as a description of my own practice, something I’ve been doing for a long time. What’s the problem? The problem is that it intensifies the churn. It doesn’t cure it or stop it or help it. It’s creating part of the problem. A world in which everybody did that would be a hundred times more disturbed than it is right now. Yesterday, I posted on a 1970s talk by Donella Meadows, above is a 1990s one. Speaking at the University of Michigan, Dana offered a tour de force introduction to system dynamics. At the end, she was asked the classic question, Tolstoy’s question: “What is to be done?” I’m always interested in how people will respond to this challenge — perhaps because it’s a question I often ask myself. Dana, as in her famous leverage points essay, pointed to the mindset or paradigm out of which the system arises. In this case, the system under discussion is the global socioeconomic system, and the dominant paradigm is the ideology of growth. Q: I’ve come to every one of these lectures, and I always try to deduce: What should I change in my own life, on the basis of this lecture? What should I do differently when I go home tonight or tomorrow morning? What can I do to be more than just a random element in the system? Dana: What a great question! And what a great way to attend this series! Congratulations. That’s wonderful. It doesn’t matter where you attack the mindset. It’s all around you. It’s in the grocery store. It’s in the schools. It’s in the home. It’s in your family. You are never out of shooting range if you want to shoot down the mindset of more, of growth. So what I would say is: Just question it. Observe what comes back at you, and question it some more. Just start saying: Really, why do we need more? Really, how much is enough? Really, who needs more, of what? There are people who need more. There are. It’s not that we should have no growth. It’s that we should stop worshiping growth and start getting smart about how much of it we can have and what it costs us. I’m sure Herman Daly told you: There are forms of growth that make you poorer, not richer. Start distinguishing them. Just go around and question. Dana’s talk begins at 6:15 on the first video, above; the piece I’ve transcribed is from the fourth video. Systems+sustainability pioneer Donella Meadows had an unusual ability to connect with students, audiences, and workshop participants. One senses this connectivity in her audio and video recordings. Thanks to the work of the Vermont-based Donella Meadows Institute, such legacy recordings and materials are now more accessible. One audio file I found in the Institute archives is from a talk Dana and Dennis Meadows gave at Lindisfarne, a think tank and retreat center established in the early 1970s by William Irwin Thompson. The topic of this talk is their experiences at Dartmouth, where they’d taken faculty positions soon after the 1972 publication of Limits to Growth. Dana’s assessment was scathing: the institutional structures of higher education were, she insisted, detrimental to actual learning. I came out of it (i.e., this experience) with very strong idea of what education should be … an idea that: No one can teach anyone anything. One can simply set up circumstances in which a person can teach themselves. Those circumstances need to be somehow related to their real-world and current concerns. And the current concerns of 18-22 year-olds are something different than that of the average 45 year-old philosophy professor or whatever. And that one has to take these things into account in the classroom.